Tonye Cole, the candidate of the All Progressives Congress APC, in the 2019 governorship election has called for fresh conduct of elections in Rivers State. I set out determined that I must find an answer to the malaise and a solution that would spare us as citizens, the death and destruction that unbridled fear brings. The challenge in itself seemed insurmountable when even before a single vote was cast, the by-word in Rivers State was insecurity and violence but to not face the challenge wasn’t an option and to not seek a solution was cowardly to say the least and so I embarked on a journey to entrench peace into our politics and to instil hope in the hearts and minds of the people. Hope - this word and emotion was driven home to me by a study that showed human behaviour is driven by the two extremes of fear and hope, with multiple combinations of both in between. I reasoned that even though fear was a dominant short term emotion that delivered immediate results for the benefit of a few, hope was a far better long term emotion that delivered lasting results for the benefit of the majority, so I chose to anchor on hope to bring the Rivers People the succour that was so desperately needed. What must we do?labeled as electorally violent. We are sick and tired of these negative headlines. This is as theneighbourhoodonline.com reports that “even before the conclusion of the Governorship and State House of Assembly elections which it suspended in Rivers State, the Independent National Electoral Commission, INEC, had declared the candidates of the Peoples Democratic Party, PDP, winners. “The Commission had also prepared their Certificates of Return, including that of Governor Nyesom Wike, inside sources have revealed. 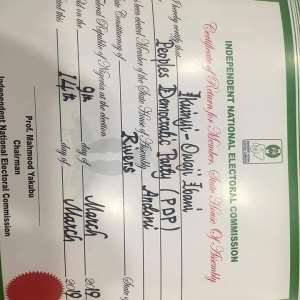 The certificates, which have the name of the National Chairman, Prof. Mahmood Yakubu, only waiting to be signed-off, are reportedly in the custody of the Resident Electoral Commissioner, REC, Obo Effanga, who it was also alleged, was the mastermind behind the certificates-before-election-results deal with PDP. “Though the electoral umpire had suspended the Rivers' elections via a statement on March 10, 2019, the certificates bear dates later than the April 15 date INEC said collated results would be declared. In its latest press statement on the election saga in Rivers State, INEC gave April 19 as the date that certificates of return will be issued to winners. Extract of the letter reads:thThe leadership of African Action Congress in Eleme Local Government Area of Rivers State hereby uses this medium to make a complaint on acts of collusion and connivance with the Peoples’ Democratic Party to mutilate, alter and falsify collated results of the March 9statehouse of assembly in Eleme Local Government Area of Rivers State in favour of the People’s Democratic Party by your Electoral Officer in Eleme, Mrs.Patience Eval. Eleme Local Government has 10 wards, and we are pleased to inform you that the governorship and State house of assembly elections in Eleme were generally free, fair and peaceful, except in ward 5 (Ekporo) where thugs carted away electoral materials upon arrival for distribution to the various polling units. Reports by the various security agencies that monitored elections in Eleme Local Government Area attest to this fact. A photocopy of a report by the Divisional Police Officer of the Eleme Divisional Headquarters of the Nigeria Police Force is attached herewith for your perusal. Just as collation of results was suspended, we have observed that your Electoral Officer in Eleme, Mrs. Patience Eval is conniving with the leadership of PDP to mutilate, falsify and alter the above collated results in favour of their candidates. Our observation was corroborated by disclosure by Dr. Mike Alagala, the coordinator of collation officers in Eleme that Mrs. Patience Eval called him few days ago that his attention was needed in her office, and upon his arrival thereof he met Toba Baribe, the returning officer for Eleme and BomaBamson, the Assistant Electoral Officer in Mrs. Eval’s office and they gave him a copy of a result sheet wherein the results herein stated above have been badly mutilated and altered in favour of PDP to him to counter-sign, but he vehemently refused to sign; and he told them bluntly that he was not going to be a part of such act of criminality. He further informed us of his predicament that he has been receiving potent threats throughphone calls and text messages since then. Also, a couple of ward collation officers for the various wards in Eleme informed us of similar invitation and request by Mrs Eval of which they declined as well, and they are equally receiving torrents of stern threats which became unbearable and they had to switch off their mobile phones which they switch on occasionally to make important calls. The names of these collation officers are Dr. Doris Ofiliand Engr. BenardOtukowu, collation officers for wards 3 and 10. Pursuant to the above, we hereby deemed it very imperative to use this medium to intimate you and your Commission of the desperation of your Electoral Officer in Eleme and her subordinates who have vowed to stop at nothing to manipulate collated election results in favour of PDP for pecuniary gains. Upon the resumption of collation exercise as announced by your Commission, we will strongly oppose and challenge any results that are not in tandem with those already collated and duly submitted as highlighted herein. We hereby call on you to use your good offices to call on Mrs. Patience Eval, her cohorts to order with a view to ensuring that they discharge their official duties and responsibilities lawfully in the interest of all. We will appreciate your timely intervention and necessary action.